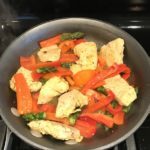 Mustard Chicken with Red Peppers and Asparagus is a recipe that I developed one night as I looked in my fridge for a new way to make chicken. 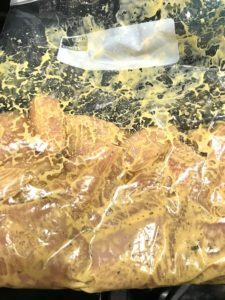 Ok, now this may seem strange, but the yellow mustard called my name and I immediately thought back to a flavor that I absolutely adored from my childhood. My Mom would make artichokes every so often and we would have so much fun scraping the artichoke meat off each leaf. But the real fun as a kid was dipping each leaf into the two sauces and licking them off. The first sauce was a melted butter and the second was a Mustard Mayonnaise dip and this one was my favorite. 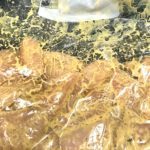 So, this recipe pays homage to this mustard mayonnaise sauce by marinating the chicken in mustard, mayonnaise, and garlic…hmmmm. 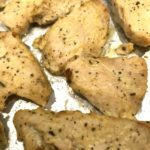 Marinate the chicken for at least one hour, then spread it out on a greased sheet pan. I cook it under the broiler first to get a nice sear on both sides, then move it down to the middle rack to cook completely through. 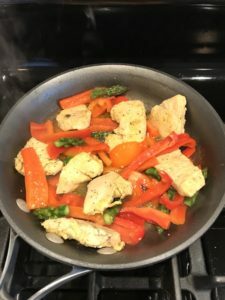 I love the combination of red pepper and asparagus for the bright and vibrant colors, the crisp and tender textures, and the sweet and salty flavors. A quick saute in a pan with a drizzle of olive oil, salt, and fresh ground pepper is all you need. I add the chicken to the pan for a final mix just to bring all of the flavors together. Honestly, this is perfect all by itself, but you can add it on top of rice or quinoa or pasta. I love Rice Noodles. 🙂 Enjoy! 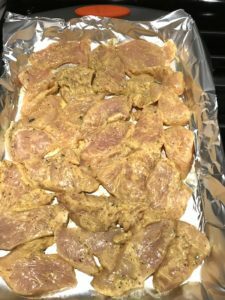 This Mustard Chicken Recipe uses ingredients that you have on hand in a new way to give you such a great flavor that is EASY to make. 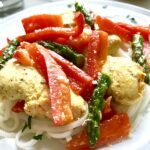 Pair with any veggies you have on hand and top it on rice or pasta and you have a meal that the entire FAMILY will love! 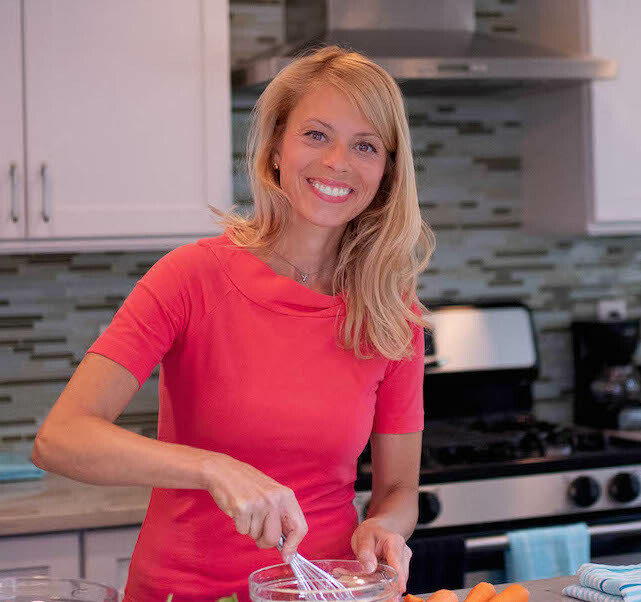 Cut the raw chicken into large chunks about 1.5 inches. Mince the garlic clove. In a large (gallon) baggie or bowl, add the mayonnaise, mustard, minced garlic, salt & pepper. Mix together. 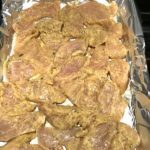 Add the chicken chunks and mix around to coat in the marinade. Let sit in marinade in fridge for 1-4 hours. 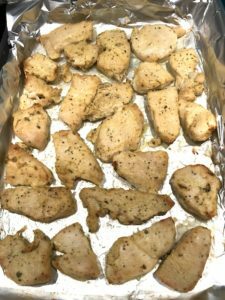 Spread the marinated chicken on a oiled sheet pan. Make sure that all pieces are separated and are not touching. Place under the broiler on the top rack to give the chicken a sear. 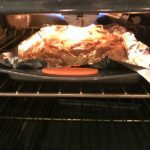 Cook under the broiler for 5 minutes then remove flip each piece, then put back under the broiler for another 3-4 minutes. 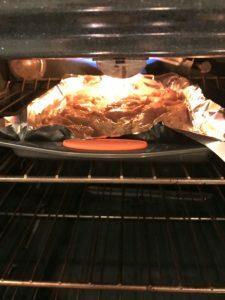 Move the chicken down to the center rack and turn the over to 350 degrees F. Cook for another 12-15 minutes or until the chicken center reaches 165 degrees. 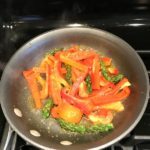 Slice the red pepper into thin strips. Rinse the asparagus and cut off the bottom woody ends. Then cut into 1 inch pieces. 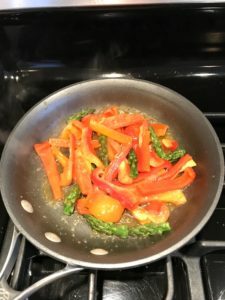 Add a tsp of extra virgin olive oil to a preheated saute pan and then add the red pepper and asparagus pieces. Saute for about 5 minutes. Add the cooked chicken to the pan with the veggies and mix to combine. 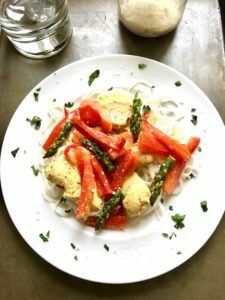 You can eat this Mustard Chicken with veggies recipe all by itself! 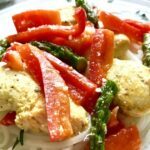 Or you can serve with polenta, rice, pasta, quinoa, or cauliflower mash! 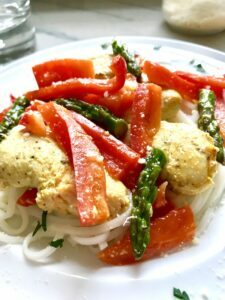 I love to serve it over Rice Noodles! Finally, I garnish with a sprinkling of grated Parmesan Cheese, but this is optional. Next > Fish and Chips – Baked Crispy!